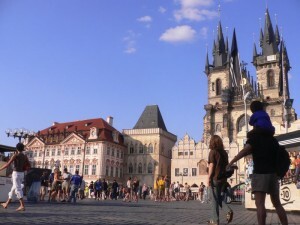 The Czech Republic has fast become a popular tourist destination, and its capital Prague, is the usually the first stop. So what can you do and see in the magical city of Prague? Read on to find out. Ask any Czech and they will say that Czech beer is the best in the world. And where else can you find that but in Prague? Thing is, if you ask about the best beer in Prague, you just might have to go drink yourself till you drop to find out. In any case, start with Gambrinus, as it seems to be the most popular beer in town. You should also try Kozel’s Medium, which won the best Czech beer award at the Research Institute of Brewing & Malting awards. Then there is Pilsner Urquell and a whole lot of other brews. Ever since 1490, this clock has been drawing attention from people. The mysterious zodiac figures on the clock face might take you a bit to figure out, and every hour from 8am to 8pm, you get to witness a lesson on morality as the people of the Middle Ages saw it. If you are planning on a destination wedding, you might want to consider getting married in Prague. This city is full of Baroque churches and old architecture – perfect for that wedding you have been dreaming of. Prague is full of old world charm. You can spend days upon days just wandering around the city visiting castles and other historical buildings. Don’t miss the Prague Castle, St. Vitus’s Cathedral and Villa Richter. The Astronomical Clock shouldn’t be talked up too much. I can’t even begin to count the number of times I’ve watched massive crowds of tourists stand underneath the clock, cameras poised, for more than a few minutes only to see the actually event, start to finish, and say, “That’s it?!? !” It’s worth looking at but not worth getting too excited about. It’s pretty anticlimactic, actually, and people’s high hopes for this crazy little clock tend to be dashed. As for beer, look for signs (usually outside of the Old Town) for “Tankove Pivo.” It means the beer is in giant tanks that keep it fresher and more delicious than its keg-kept counterpart. Seriously, you’ll thank me when you try it.